North of the Wall in Westeros, live a group of people known as the Wildlings to those unfamiliar with them. These people refer to themselves as the Free Folk. There may be upwards of hundreds of thousands of people split into their own cultures, tribes, and clans. These groups are loosely associated, but when war comes to the land, they are willing to join under one banner and fight together. In the South, combat is largely considered the realm of men, but the Free Folk have different ways about them. Women make for ideal flankers on the battlefield, adept at both taking charges and leading attacks of their own. The Spearwives are not equipped with the best weaponry. What they bring to a battle is crude, but effective, and most importantly, plentiful. They hurl their projectiles with a deadly accuracy that causes major problems for opponents, and intelligent commanders can take advantage of this skill. The harsh environment of the North has toughened up the Spearwives. They don’t lose Attack dice until they are on their last rank, making them a consistent threat throughout a game. They are able to cause damage at range, but don’t shy away from engaging an enemy close up either. This type of flexibility makes them extraordinarily valuable. Like all Free Folk units, the Spearwives are cheap to add to your ranks. For such a versatile unit, they will still allow you to fill your forces with other warriors. It’s that very versatility that make them an excellent addition, especially if they’re paired with the right Attachment. Included in this unit box is the Spearwife Matriarch Attachment. She grants the unit Swift Retreat, giving them the ability to retreat to a safe distance after they have been attacked. The Free Folk are already very mobile, and with the Matriarch’s help, they become even quicker. She is an excellent choice as an Attachment for the Spearwives. 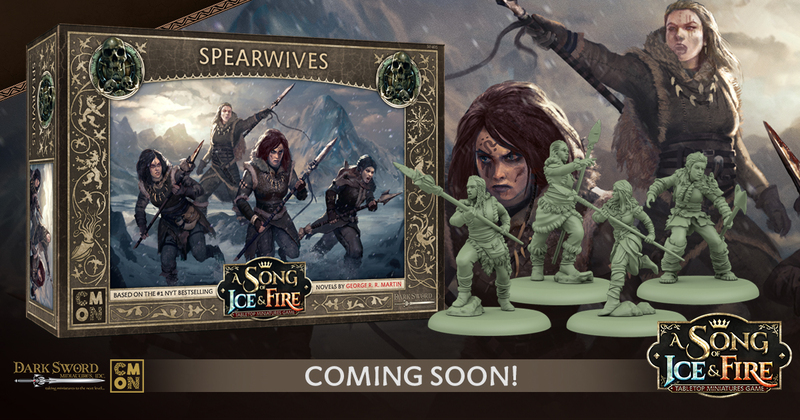 Included in the Spearwives unit box for the A Song of Ice and Fire: Tabletop Miniatures Game are three different unique, highly-detailed sculpts with four copies each, and a single Spearwife Matriach figure, as well as a movement tray and all of the necessary cards. They are ready to join the fight right out of the box. The Southerners may not appreciate the skill and ferocity that the women of Westeros may bring to their armies, but the Free Folk are about to give them a lesson in overlooking half the population. The Spearwives can be devastating if used effectively, and under the right Commander, they will make a diverse Free Folk army even more flexible.